275kg max. UDL capacity per shelf. Strong epoxy coated blue steel frame. 5 chipboard shelves, adjustable in 34mm increments. H x W x D: 1800 x 900 x 450mm. Whether it's at home or at work storage systems are a great investment providing a great way to keep items organised and out of the way. Our 275kg premium boltless shelving kit is a great choice for areas, such as workshops or garages, to keep items or equipment out of the way but accessible for when they are required. 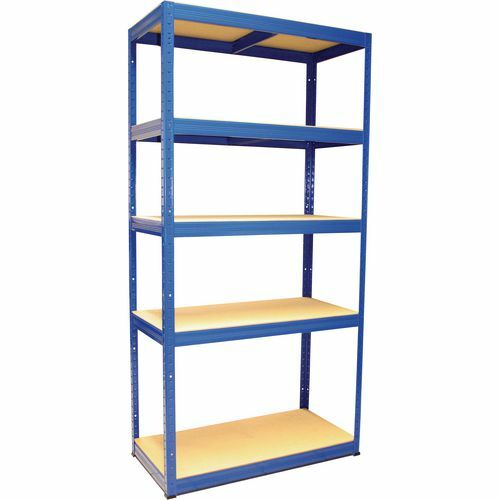 The strong epoxy coated blue steel frame provides durability and there is a 275kg maximum UDL (uniform distributed load) capacity per shelf. There are five chipboard shelves, providing a good amount of surface area to store items. 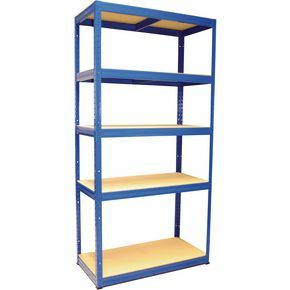 A great feature of these shelving units is that the shelves can be adjusted in 34mm increments, allowing it to be changed to suit the requirements of the user and the items being stored. Our 275kg premium boltless shelving kits can offer an ideal storage solution in many areas; self-assembly is required and they come with FREE UK Delivery.